Listen, we get it - competition for the best-decorated house on Halloween is fierce! Some neighborhoods care about safety, others care about raising property values, but your neighborhood? If that homestead ain’t scary, prepare to be shunned at the next Neighborhood Night Out! So you, friend, gotta pull out all the stops this year and come up with the best tricks for those seeking treats. 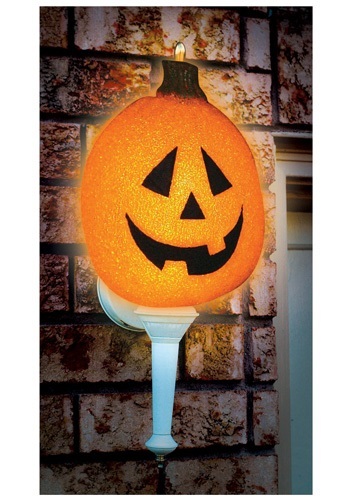 And that's where this Sparkling Pumpkin Porch Light Cover - Outdoor Halloween Decorations comes in! Sure, Carol down the block will be smugly covering her porch light with big plastic spiders and fake webs (again…what is this, Carol, like the 6th Halloween in a row? Hello, try something new for once in a decade!) but by now, that idea is a total snoozefest…you need something that stands out, a decoration so good that it sparkles! And with this decoration - made of flexible molded vinyl and measuring in 12.5" high, 10" wide, and 4" deep - all you gotta do is slip it on over your porch light with an elastic band attached to the pumpkin, turn on the light, and then stand back and get ready for the year-round compliments on how that smiling gap-toothed pumpkin glows! Take that, CAROL!